Who’s ready for Valentine’s Day?! Valentine’s Day holds some funny traditions for John and me. When we were dating I had a very health-conscious roommate who would occasionally go all out on hard cider and a bucket of fried food (namely chicken and biscuits). It was like hearing the pope swear – mind blowing. Valentine’s Day was just a few days away and after seeing my friend relish in her big splurge, we decided to follow suit. And what would trashy food be without a good comedy flick? Nacho Libre is our go-to choice every time. Pretty much every Valentine’s Day since, we’ve indulged in some form of junk food and hard cider and watched Nacho. This year, I think I may need to add these truffles to the mix. They’re too simple and too delicious not to. 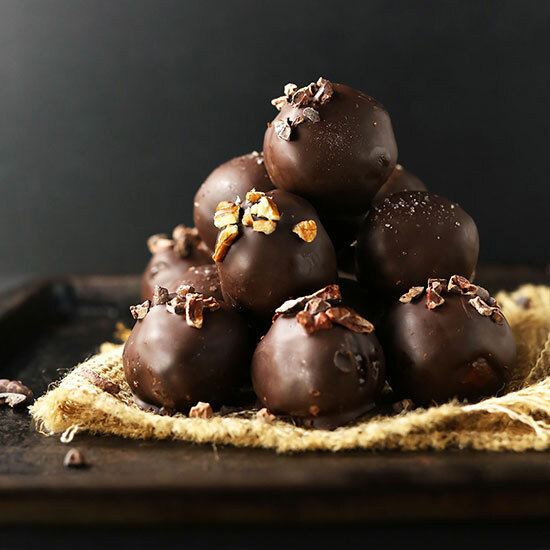 These may not be truffles in the traditional sense, but they certainly fool the palette into thinking you’re indulging in a decadent chocolate truffle. Toppings are optional but recommended for an extra something special. I went with pecans, sea salt and cacao nibs! No regrets. 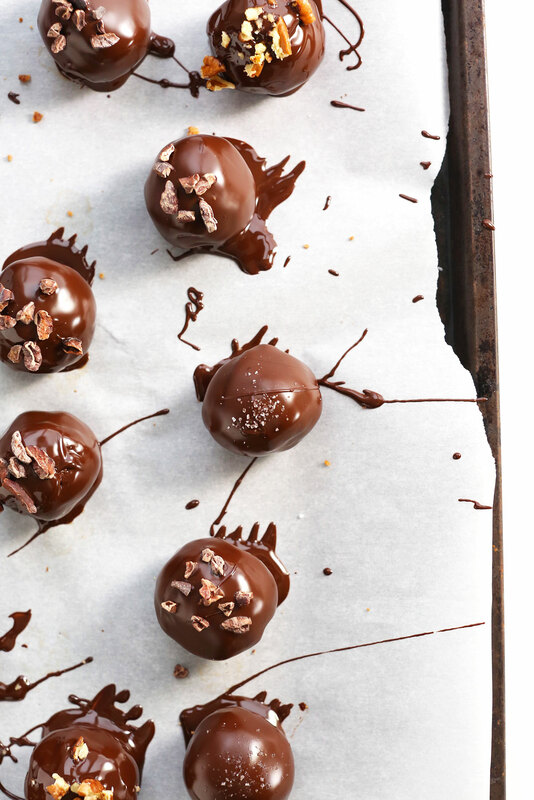 If you try these truffles, show us! Take a picture and tag it #minimalistbaker on Instagram – we’d love to see! Happy Valentine’s week, friends! We hope it’s lovely. 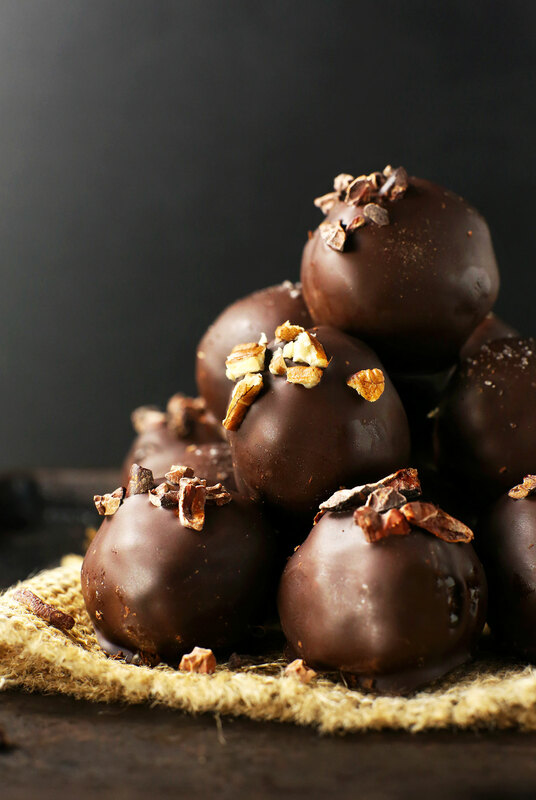 Simple 30-minute vegan chocolate truffles in a decadent dark chocolate shell. The perfect healthier dessert for Valentine's Day, special occasions, or just because. Place pecans and walnuts in a food processor or high speed blender and process until it reaches the consistency of a meal. Remove and set aside in a dish. Next, place pitted dates in the food processor and process until small bits remain and/or it forms into a ball. Then add in the cocoa powder and 1/2 of the nut meal and pulse. Continue pulsing and adding the nut meal a little at a time until a loose dough is formed. You may not need to use all of the nuts, which is fine because you can use any leftovers for topping the truffles. Once you have a dough that's easy to form into balls, scoop out 1 Tablespoon amounts and roll/carefully form into balls. (If they aren't quite forming, hold in your palm and let the heat of your hand warm them, then gently shape into a loose ball.) 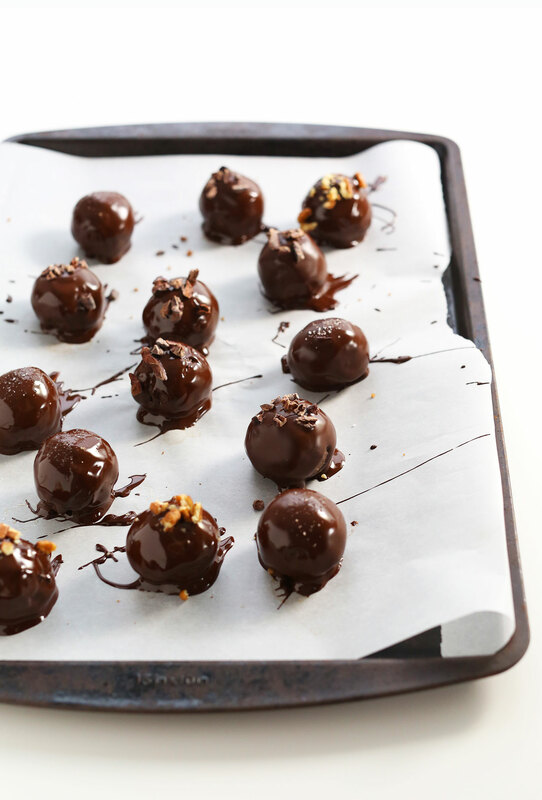 Set on parchment paper and place in freezer to chill - you should have about 14 truffles. 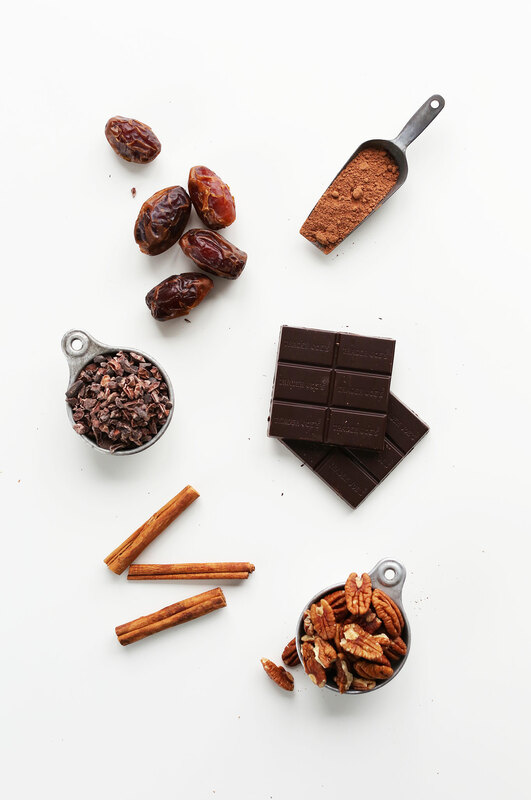 In the meantime, melt chocolate in a double boiler or in the microwave in 30 second increments. Be careful not to overheat. Once melted, stir in coconut oil to help the chocolate thin and ease the dipping process. Remove truffles from freezer and, one at a time, dip them into the melted chocolate. Use a fork to remove them and tap away excess chocolate. Transfer back onto parchment paper and top with sea salt, crushed pecans, or cacao nibs. Repeat until all truffles are dipped. Let set at room temperature. Store leftovers in an airtight container at room temperature. Transfer to freezer for longer term storage. 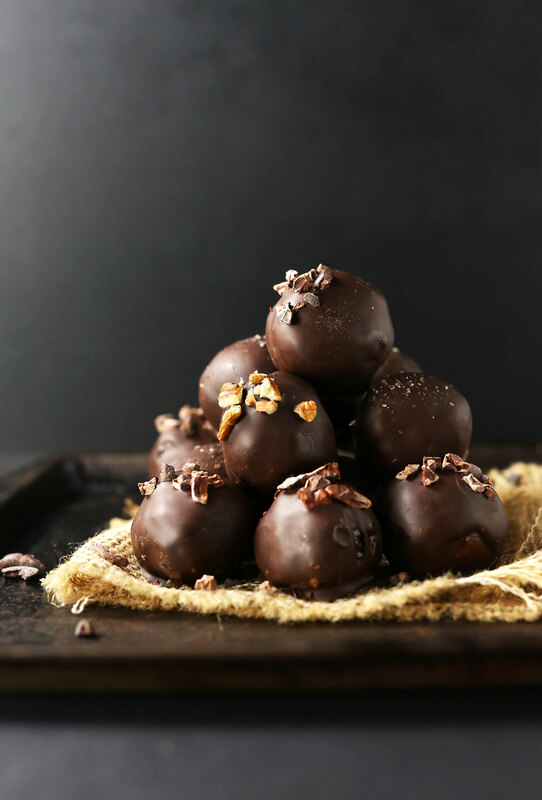 *To cut down on sugar/fat content, halve the amount of semisweet chocolate and, upon melting, simply drizzle over the truffles instead of dipping. *Nutrition information is a rough estimate calculated without optional ingredients. I have a bunch of relatives including two vegan sisters and one dairy-intolerant brother in law, so I have made a couple of batches for Easter. Had no issue rolling them into balls – I did a ‘squeeze together’ technique at different angles to make sure the content was first stuck together, then gently palm-rolled them into perfect balls. I wasn’t sure if I had the right dates, so I soaked them for 5 min anyway and I think that created the moistness I needed. I made some honeycomb earlier, and crushed some of the excess pieces up and sprinkled them on top of the chocolate, along with the salt and excess nut mix as suggested. I am storing them in the fridge in an airtight container because it is quite humid at the moment and I find when I moved the truffles to the container they started to melt against my fingertips so hopefully they stay solid! I made a couple batches of the candied spiced nuts, the first turned out great but I burned the second… I will just say I went for ‘scorched’ nut effect haha. Anyway, Looking forward to making a few batches of the white truffles tomorrow! I don’t know if I can upload photos here, but the truffles do look just like the photos on this site (maybe even better because of the honeycomb harhar!). I never write reviews so that’s why this is so long. I tweaked it a bit – swapped the dates for some agave nectar and a little cashew butter and infused the whole thing with rosemary and sea salt – yum! Thanks for sharing your recipe changes, Ailsa! We’re glad you enjoyed it! Great recipe, I made it with the children last year and noted metric weights for the Europeans looking at this: 175g dates, 300g mixed nuts, 100g dark chocolate (covers a bird of the truffles). So excited to make these tonight! When do I add the sea salt and cinnamon? I don’t see that in the directions. Hi! You can add it along in step 3! Good luck! Still wondering why no choc chips? I have vegan choc couverture chips, they should work, right? Chocolate chips have ingredients to help them keep their form once baked which can mess with the truffles. But give it a try and let me know how it goes! It’s our family tradition to gift my dad chocolate truffles and eat them on Christmas day. Since my sister became vegan, I was hoping to give her some vegan truffles (and they’re not easy to find in stores or online). Luckily I stumbled on this wonderfully simple and delicious recipe. I’ll just note a few things that might be useful to anyone making this recipe for the first time. When I was processing the dates, I found that pulsing the food processor worked best to give an even and completely blended product. Like the recipe said, I had some leftover nut mix. I also added extra coco powder (2 tbsp instead of 1 tbsp) to make the filling more chocolate-y. The balling processes was a bit messy because the nut oils get extracted from the food processor, but the filling held its shape perfectly. Instead of a vegan chocolate bar I use vegan chocolate chips (enjoy life dark chocolate morsels) and because the chips were just chocolate and sugar, they completely hardened after a few hours at room temp. Let me tell you these chocolates were incredibly tasty! I’ll probably make these chocolates for non-vegans too. I just have one question…how long will these truffles last and how should they be stored? Right now I’m storing them in the refrigerator but I’m not sure that’s necessary given the ingredients. I made these for my first vegan thanksgiving and my family went crazy over them. Will definitely be making more of these, thank you for the recipe! I wonder if you can taste the difference between normal and vegan truffles! Im sure its not a huge difference, but these look amazing! I’m definitely trying this out! just made these – asked my friend to come round with her nutri bullet. worked though had to pulse ingredients in small batches. they shaped up beautifully and just had one with a coffee after dinner to test them in the proper environment – lovely. not too sweet actually. didn’t have medjool dates so used ordinary which will have cut down the amount of dates in them. lovely recipe tho, made 28 truffles in an hour or so;). Thanks for the site and the recipe. Yay! So glad you enjoyed them, Natalie! Thanks for this! I was very inspired by this recipe. After having some disappointing cherry chocolate cordials, I realized I should just make it myself. I tweaked your recipe some. I don’t like walnuts and hubs doesn’t like pecans so I used hazelnuts. I used 3 tbsb of cocoa powder and 1 1/2 oz of Grand Marnier. It wasn’t sweet enough so I put 4 tsp of date sugar in the filling. Also, it seems that they really should be kept refrigerator. Maybe it’s just my chocolate. How long will these truffles keep? My Grandaughter is a Vegan and I want to make them for her for Chrismas. I love that my 9 year old just made these by herself. She’s entering a friendly dessert contest at school tomorrow and I have to believe she will win. So delicious! And I doubted that the dates were going to be good in a truffle. I’m sorry I doubted you. You’re never wrong. I’ll let you know if she wins! I made these last night and they were sooo delicious!! My first batch ended up being too nutty tasting, so I added a little bit of honey, and they ended up so perfectly sweet and sticky!! I used some old salted chocolate bars I had in the fridge for the dip and they just taste perfect. Thanks for creating and sharing, I love your recipes!!! Anxious to try! I have BAD luck with coating truffles with chocolate and coconut oil. Yours look perfectly set! When I have tried with other recipes…the chocolate gets very messy…melts in your fingers. Wondering how yours set? Would like to serve at a tea party with linen napkin, but don’t want chocolate mess. Have always wondered how candy makers do it? Any thoughts? Tx. Love, Love your site! If you let them set out at room temperature long enough they should set just fine. And for dipping, use a fork! That keeps your hands clean. Good luck! I was a little confused however about the cinnamon and salt. I didn’t see it in the instructions for where to add it (I’m sure it is assumed to add it to the nut mixture, but I just totally forgot about it until the very end because it wasn’t listed in the instructions. )… so what I ended up doing was mixing the cinnamon into the melted chocolate and grinding some sea salt on top of the truffles after they were dipped. So they still had those flavors they were just in a different area. Final review is that they are very good! I will make them again and serve them with something to cut the richness for everyone else. Nachooooooo! Sounds like the perfect way to spend Valentines Day to me! So great to hear from a new reader, Nancy! You can find all of our kitchen essentials here! As far as a food processor go, I’d recommend Kitchenaid as a brand in general. Good luck! These look divine!! I like how simple (and healthy) they are. These look so good! And I have all ingredients except for dates, and roads are iced over. I’m definitely making these as soon as some of the ice melts! Could I substitute another type of oil, like olive oil? We have coconut allergies here but these look so good otherwise. Happy Valentines Day John & Dana! Just to let you know I’ve linked this recipe into my latest post of my 13 favourite Valentines recipes and bloggers :) because they look irresistibly SCRUMMY! Lately I have been preparing a lot of bite-sized healthy treats so my husband can take to work, instead of the packed unhealthy treats. This are next on my to-do list. Pinned! Yum, I have all the ingredients too. Huzzah! PS we tend to pig out on our favorite food as well: cheese! This… this is everything I want in a truffle. <3 Beautiful, beautiful job as usual, Dana. I hope you and John have a fabulous Valentine's Day/weekend! Pinning this! This…. this is everything I want in a truffle. <3 Beautiful, beautiful job as usual, Dana. I hope you and John have a fabulous Valentine's Day/weekend! Pinning this! Making these today, but just wondering why not chocolate chips? These look so tasty, I was curious if there are measurements for the dates since I will be using another type other than medjool. Hi there, this recipe looks so tasty and is just the thing to try out on my husband for a healthy dessert. I don’t have any medjool dates so I’m curious if there are measurements for using another type? Use the same weight I’ve provided (I also include it in cups)! Where does it say the amount in cups ??? Did you say “truffles”? Oh my, they look soooo delicious! What can be a better occasion than Valentine’s to make them? And your photos are stunning, Dana! I love all your photos, Dana, but the ones in this post… OMG. Wow. I can’t stop staring!! This recipe is going to happen in my kitchen ASAP. I’m literally drooling. WOW! Those seriously look incredible. I am pretty sure the pictures dont do them justice (and those are some gorgeous pics). Thanks for sharing that recipe! Yum! I just posted a similar recipe (with almonds and cherries and nibs, oh my!! )-but didn’t cover my truffles in chocolate! I will most certainly do this next time :) good stuff!! Just made a batch of these and they are delicious!! The salt on top is just what they need for that perfect sweet/salty balance. 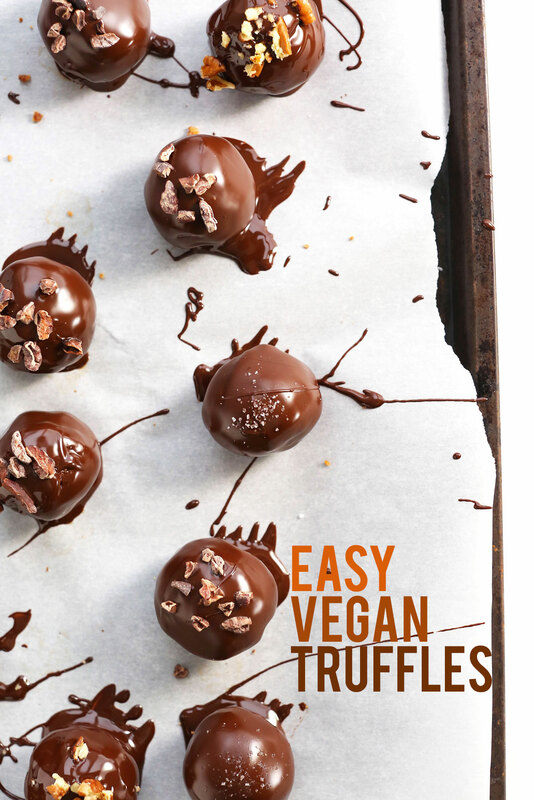 These look better than non-vegan truffles!! I am ready to try these this week! They look fabulous… but what brand of dairy free dark chocolate bar do you use? I have a well-stocked Whole Foods near me and I buy dairy free chocolate chips, but have never found dairy free in a bar form. Can you tell me what brand you use? Oh really? Trader’s actually has a dairy free dark chocolate bar. But Whole Foods should have the motherload. Thanks Nicole! So kind. Hope you love these! I have a question and not a comment. I am an avid medjool date eater but recently discovered that some can contain insect eggs and mold? is there a certain type to buy to avoid this, or is it just apart of buying dates? Hmm, never heard of that. I always buy mine from Trader Joe’s and have never had a problem. I would seek out other sources if yours have issues. This is a great question, and I actually came across this from the bulk dates from Whole Foods in my town. I would say to always buy packaged, fresh and refrigerated dates (unless you live in a climate that readily produces dates)-like what Trader Joe’s sells. Likewise, I buy a package of Joe’s dates each week, and haven’t seen any mold or nasty critters since I have started this habit about 4 months ago. I would also advise to follow the same principles with figs, as they are prone to contamination by insects and mold…probably due to their lack of sulfites and other browning (polyphenol oxidase) inhibitors. When in doubt, go to a store that you know goes through inventory fast-like your local hippy-dippy cooperative :) good luck!! These look amazing, especially with some sea salt sprinkled on top!! These are perfect for Saturday! Great idea to make healthy energy balls ready for Valentine’s day! Any suggestions for an alternative to dates? I think most sticky-ish dried fruits would do, such as dried blueberries, cherries, figs, raisins or cranberries. Thank you, I think I’ll give the cranberries a go! I did it with prunes and it worked very well. 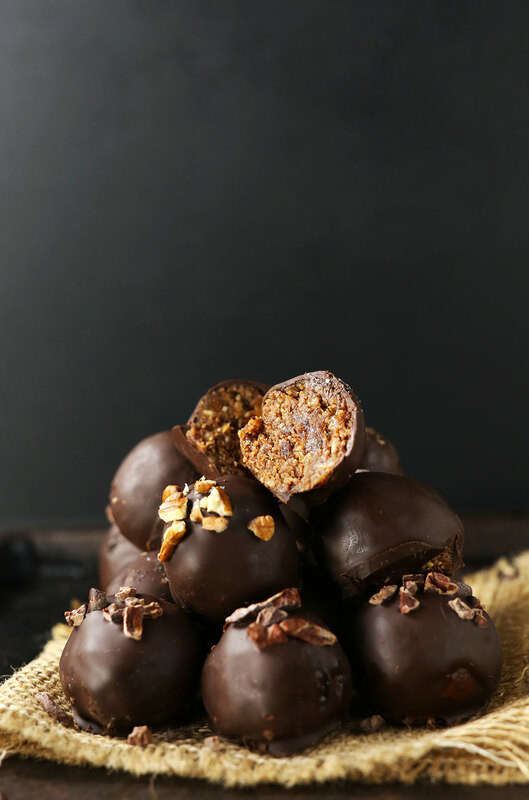 These are like the classic raw date balls, but all fancied up! So kind! Thanks Natalie! That tottaly made my pre-Valentine’s Day :D Let me know if you get the course and how you like it! We’re getting ready to add our artificial lighting section soon! STOP! These look insane. Must try. I love these little bite sized truffles for Valentine’s Day!! These are mega stunners – I am dying to try them!! And that date filling sounds like perfection! I love your commitment to healthier foods and thank you to share. As it is Lunar New Year next week, I’m going to visit Plum Village in Hong Kong and plan to make these goodies for the Nuns& Monks as they are vegan… I’m so excited to try your recipe ! :) Yeah! hope they go well…. I’d never thought our recipes would serve monks and nuns! So honored. Thanks for sharing! Hope everyone loves them and Happy Lunar New Year! could i add another binding ingredient or something I didn’t do correctly? the meal was not easy to shape therefore any suggestions pls maybe more dates as this is the binding ingredient? thank you. It can do that sometimes if your dates aren’t big / moist enough. I’d recommend adding a little bit of nut butter or coconut oil and mixing until a firmer dough forms! You can also just put a little oil on your hands and help them form that way! I made them again with different dates and the oil did the trick ! fyi, i used almonds , cashews , pink salt instead as didn’t have pecans or walnuts or sea salt..
and also added some chestnuts :) …thank you. I love your commitment to healthier foods and thank you to share. As it is Lunar New Year next week, I’m going to visit Plum Village in Hong Kong and plan to make these goodies for the Nuns& Monks there as they are vegan… I’m so excited to try your recipe ! :) Yeah! hope they go well…. Haha! My husband and I have a similar tradition where we eat something trashy (usually Chinese takeout or Domino’s pizza), drink beer or cocktails, and binge-watch television or a fun movie. There also has to be chocolate dessert of some kind. These sound great! Delicious! I love truffles:) I’m not familiar with too many vegan recipes or eating restrictions. What makes these truffles vegan?